Walsall Council has a successful history of working with our local communities and partnership working. 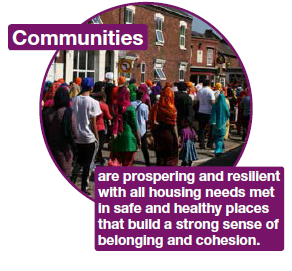 Our local Councillors and officers, across many service areas, engage with our communities on a daily basis. The support given to communities ranges from jointly working with local people to tackle local issues, such as anti-social behaviour and fly tipping to supporting them in the delivery of local events to promote social inclusion and civic pride. The overarching aim of the support provided is to enable communities to become self-sufficient as much as possible. Particular focus is underway on engagement with new communities and how the Council needs to adapt to ensure cultural competency. The Community Cohesion Team focus on providing support to communities in a variety of ways; their work can vary from supporting an individual ostracised by their community due to divorce to supporting events to build understanding and relationships between young people and older people and working to support specific cultural groups through events such as festivals, community barbeques and sporting competitions that celebrate the diverse communities of the borough. An important aspect of the work of the Equalities Team is carrying out research into new communities living in Walsall and ensuring these are adequately reflected in diversity monitoring profiles for future planning purposes and ensuring services are able to reach all the communities that they serve. An example of this is the New to Walsall initiative which has supported services in the production of information material in 11 different languages and also disseminates information through the dedicated Twitter and Facebook accounts enabling new and emerging communities access to information. Political oversight and involvement through Strategic Locality Partnership Boards. Operational Locality Panels with a focus on delivery. These will be effective and sustainable. A rationalisation of meetings currently being supported. Involvement of the Voluntary and Community Sector and Businesses in the new locality model. A Locality Plan for each of the four areas supported by evidence. This plan will utilise both bottom up and top down approaches to engagement and decision making.